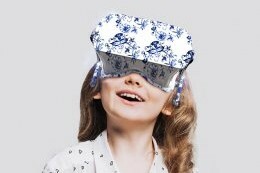 Mobile 3D Talking Head wins BEST PAPER AWARD at the SiMPE 2010 Workshop !!! Microsoft Interoperability Lab at CTU. 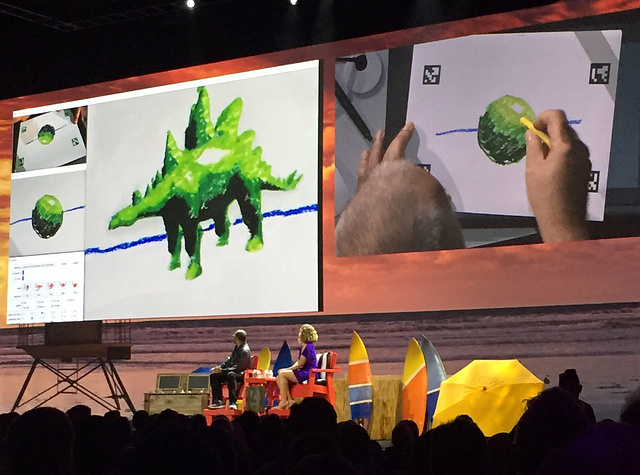 Abstract: Scale and scalability have been recurring topics in visual computing. Visual computing uses computer‐supported, interactive, visual representations of (abstract) data to amplify cognition. In recent years data complexity concerning volume, veracity, velocity, and variety has increased considerably. Multiscale models, e.g., from structural biology, require multiscale dynamic color mapping with sometimes overlapping or contradicting colors. We present a technique, which adaptively, based on the current scale level, nonlinearly and seamlessly adjusts the color scheme to depict or distinguish the currently best visible structural information. Data‐sensitive navigation for user‐interface elements is presented. The approach re-scales and normalizes user input according to visual change, and also visually communicates this re-scaling and normalization. In this way, output‐sensitive interactions can be realized. Another example deals with multiscale visualization and scale-adaptive modification of DNA nanostructures. This new way of observing, interacting with, and creating DNA nanostructures enables domain experts to approach their work in any of the available semantic abstraction levels, supporting both low-level manipulations and high-level visualization and modifications. Research challenges and directions with respect to scale and scalability are sketched at the end of the talk. Bio: Eduard Gröller is professor at the Institute of Visual Computing & Human-Centered Technology ( VC+HCT), TU Wien, Austria, and adjunct professor of Computer Science at the University of Bergen, Norway. His research interests include computer graphics, visualization, and visual computing. He is heading the visualization group at VC+HCT. The group performs basic and applied research in all areas of visualization He is a scientific proponent and key researcher of the VRVis research center. The center performs applied research in visualization, rendering, and visual analysis. Dr. Gröller has been chief editor of the Journal Computer Graphics Forum in the period 2008-2011. He became a fellow of the Eurographics association in 2009. He is the recipient of the Eurographics 2015 Outstanding Technical Contributions Award. With the rise of AI and Data Science supportive technology increasingly takes decisions on our behalf, such as which data to share with whom or who to contact if help is needed. In the CoreSAEP project (lead by Dr. M. Birna van Riemsdijk - TU Delft) we develop theory and technology for creating software that understands and adapts to our norms and values in taking such decisions, which we call Socially Adaptive Computing. In this presentation we focus on one such agent, called HabINT, that aims at supporting people in their daily activities. We give an overview of the knowledge representation formalism that HabINT uses to reason about norms, values, and habitual behaviour. 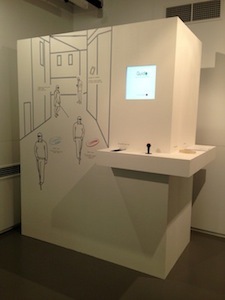 The Naviterier project at the HCI Center, Department of Computer Graphics and Interaction in Prague aims at supporting visually impaired people in their navigation-related tasks developing dedicated software. In the presentation, we discuss how to integrate the technology from both groups to provide even stronger support for visually impaired people even if they develop mental impairments related to aging. Prof. Catholijn Jonker is a full professor of Interactive Intelligence at the Faculty of Electrical Engineering, Mathematics and Computer Science of the Delft University of Technology. Catholijn is EurAI Fellow since 2015, and EurAI board member since 2016, EurAI is the European Association for Artificial Intelligence. She is a member of the Koninklijke Hollandsche Maarschappij der Wetenschappen and of the Academia Europaea. Her publications address cognitive processes and concepts such as negotiation, teamwork and the dynamics of individual agents and organizations. In all her research lines Catholijn has adopted a value-sensitive approach. In particular, she works towards intelligent agents that can interact with their users in value-conflicting situations when also meta-values no longer solve the situation. Pietro Pasotti is a PhD candidate in the Interactive Intelligence group at the Technical University of Delft. He has been working on interactive agents for habit supports and knowledge structures for human behaviour representation. Our recently graduated Ph.D. student Jakub Fišer received an excited response while presenting results of his research at prestigious Adobe MAX 2017 show in Las Vegas (held on October 16-20, 2017). Awards for Bachelor and Master Students supervised by members of our department in the years 2014-2016. Two presentations, given by prof. Jiří Žára and prof. Ivan Wilhelm (Charles University, ELI Beamlines), introduced the Czech Innovation Festival organized by Czech Center in Berlin in June 22-24, 2017. Research group of Prof. Daniel Sýkora achieved a great success - their three full technical papers have been accepted to the most prestigious computer graphics conference, SIGGRAPH 2017. To present three papers at SIGGRAPH in one year is a unique goal which confirms a strong position of Prof. Sýkora's team among the best research groups worldwide. We congratulate and wish similar results also in next years! Opinions vary on what is the best image a machine can synthesize. In this talk I will discuss some possible answers: First, physical accuracy has been a classic and quantifiable objective, and I will give an example of a technique to robustly compute unbiased images. Another important aspect to discuss is computational efficiency. I will explain how rasterization abilities of modern graphics hardware can be used to introduce global illumination at interactive frame rates. Ultimately, images are made to be perceived by humans, where it is not so easy to say which image is „better“, e.g. when comparing to a reference. I will discuss the particular challenge of computing what is the best (stereo) image using a perceptual model. If the „best“ image only exists in the mind of user, computing this image is an even more substantial challenge. I will discuss examples of using Internet image collections to guide users when realizing what they imagine. Finally, images have commonly been synthesized from complete information. I will discuss some alternatives, where only incomplete information is available and extrapolation from sparse example images is made to achieve better coverage by many images. 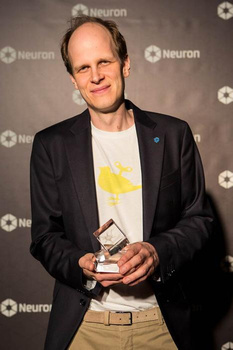 On May 24, 2017 at Neuron Awards gala, The Neuron Award for Promising Young Scientists was awarded to prof. Daniel Sýkora. Recent years have seen a number of breakthroughs that indicate a renewed interest in the possibilities of creative machines. Game-playing agents developed by Google Deepmind are capable of learning surprisingly original solutions. Deep learning allows anyone to make paintings in the style of famous artists. Other computational tools are now used to inspire and guide human designers. In this talk, we will look at examples of creative machine learning, consider to what extent they qualify as being creative, and discuss what additional steps would be necessary for artificial creativity. Stefan Leijnen is lecturer and researcher of artificial intelligence at the Amsterdam University of Applied Sciences. His primary research interest is in understanding how novelty arises from dynamical systems, particularly in neural networks. More generally, he is interested in generative computational methods, deep learning and epistomology. He has recently founded the Asimov Institute, an independent research organization aiming to develop technological solutions for creativity and control of machine learning. While it is clear that the use of computer simulations has a positive effect on learning when compared to instruction without computer simulations, there is still room for improvement to fully realize their benefits for learning. Haptic technologies can fulfill the educational potential of computer simulations by adding the sense of touch. Visuohaptic simulations may not only help students visualize abstract or invisible concepts, but they may also have the capability of enriching the learning experience and enhancing retention. Our argument is based on the idea that haptic technology can support embodied learning by grounding movements during the learning process as learners manipulate and interact with virtual objects via the haptic interface. Still, previous work that has compared visual simulations versus visuohaptic simulations has not reported conclusive results. This research seminar provides an overview of a design-based research program that investigates effectiveness of the use of visuohaptic simulations to support the understanding of difficult concepts in science. We explored a sequencing approach to address the possibility of visual information undermining tactile information, when presented together. Our preliminary studies have shown promising results. Alejandra J. Magana is an Associate Professor in the Department of Computer and Information Technology with a courtesy appointment at the School of Engineering Education at Purdue University. Her research program investigates how model-based cognition in Science, Technology, Engineering, and Mathematics (STEM) can be better supported by means of computing tools. Synthesizing natural scenes with realistic vegetation has always been an interesting research topic in computer graphics. As frequent objects in our daily life, vegetation is required in almost all virtual sceneries, ranging from single plants and trees to wide outdoor ecosystems. The human visual system is perfectly trained to see any imperfections and irregularities. Therefore, the appearance and the inhomogeneous structure of plants still pose many challenges to computer graphics researchers. Although rich and detailed virtual environments become popular in applications like games, movies or urban visualization, storing and transmitting as well as modeling or rendering such objects with full detail is beyond the capabilities even of modern graphics hardware. Figure 1 shows a small forest with large amount of detail modeled through a modern reconstruction algorithm. This talk will cover several latest algorithms and techniques in modeling vegetation in computer graphics. In particular, we will focus on advances in 1) procedural and inverse-procedural modeling, 2) biologically-based approaches, and 3) user-assisted approaches for vegetation modeling. Bedrich Benes is a professor of Computer Graphics Technology at Purdue University and a director of the High Performance Computer Graphics Laboratory. His area of research is in procedural and inverse procedural modeling and simulation of natural phenomena and he has published over 100 research papers in the field. Dr. Benes has collaborated with the National Science Foundation, NASA, Adobe Research, Intel, Siemens, Samsung, Department of Energy, and Ford Inc., among others. He has worked as IPC member of various conferences including Siggraph/Siggraph Asia (4x), Eurographics (5x), and he is a papers chair of Eurographics 2017. He also works as associate editor of Computer Graphics Forum and Computers & Graphics. His graduate students work in Adobe, Google, Microsoft, Nvidia, Samsung, and Siemens. At the General Assembly of the Eurographics Association in Lyon, prof. Ing. Jiří Žára, CSc. 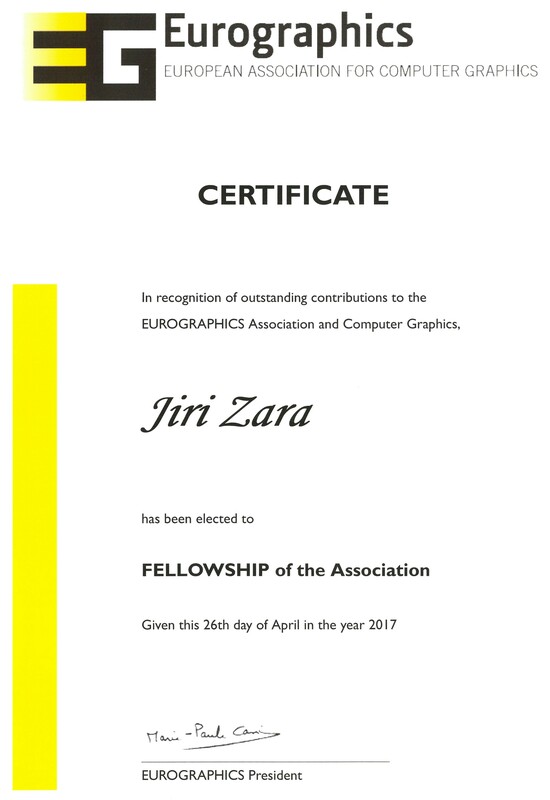 has been awarded as Eurographics Fellow for his activities in education, research, and publicity in the field of Computer Graphics. 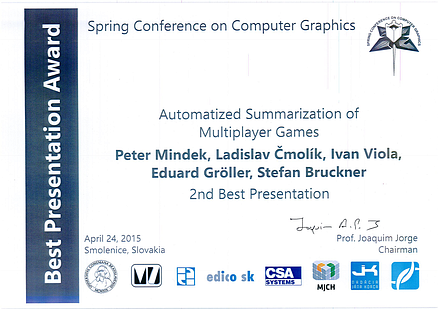 The awarded paper was a part of his bachelor thesis supervised by our member Jiří Bittner. In the days 24.11 and 25.11. 2016 20th student scientific seminar User Interfaces was held in the building of HTW Dresden (University of Applied Sciences in Dresden). Students delivered talks about their results achieved in scientific projects. Their form of participation were either thesis (BSc. or MSc.) or student projects (programme of the workshop is here). Main topics discussed in the seminar were user interfaces and computer graphics issues. Workshop organization was shared by Department of Computer Graphics and Interaction at FEL CTU Prague and Faculty of Informatics HTW Dresden. The seminar has quite a long tradition and one of aims of the seminar is to attract attention of students (both BSc.and MSc. ones) towards scientific work. The assumption is that an integral part of scientific work is presentation of the results achieved to international audience in English. A bunch of students who participated in the workshop in the past entered PhD study later on where they continued in many cases in research they presented during the workshop. After 20 years it is possible to make positive evaluation of the workshop. The scientific quality of talks is steadily increasing as well as the ability of students to communicate in English. An effort has been made to conform the format of the workshop in such a way that it should be similar to format of standard international workshops. E.g. in 2015 Proceedings were published – the Proceedings had a form of abstracts where information about each contribution was presented. Proceedings from this year will have a form of Technical report published by HTW Dresden where each talk will be presented in the form of extended abstract. In general it is possible to say that students evaluate the event as interesting and beneficial one. Proceedings can be donwloaded here. Algorithm StyLit developed at our department was presented on November 3, 2016, 6pm PDT at Adobe MAX conference in San Diego (see the video from the audience and the entire recording). During this presentation a release of interactive demo was announced for those who are interested to try StyLit in practice. Score, a traditional Czech printed magazine on video games, published an interview with Adam Sporka, a member of our department, about his work on the music for upcoming video game Kingdom Come: Deliverance. 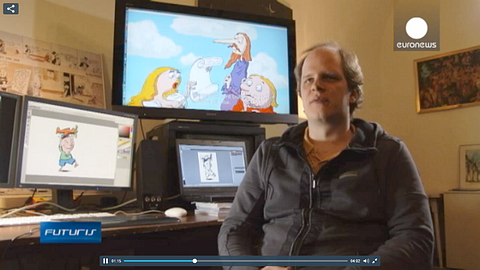 The piece is a part of the series of interviews with members of Warhorse Studios. Popular on-line magazine Cartoon Brew published an article about StyLit algorithm which was developed by members of DCGI: J. Fišer, O. Jamriška, M. Lukáč and D. Sýkora. The paper was selected also for SIGGRAPH 2016 - Technical Papers Trailer. Visualization and Visual Computing use computer-supported, interactive, visual representations of (abstract) data to amplify cognition. In recent years data complexity and variability has increased considerably. This is due to new data sources as well as the availability of uncertainty, error and tolerance information. Instead of individual objects entire sets, collections, and ensembles are visually investigated. This raises the need for effective comparative visualization approaches. Visual data science and computational sciences provide vast amounts of digital variations of a phenomenon which can be explored through superposition, juxtaposition and explicit difference encoding. A few examples of comparative approaches coming from the various areas of visualization, i.e., scientific visualization, information visualization and visual analytics will be treated in more detail. Analysis techniques which combine visualization and simulation to assist decision making in flooding scenarios, indoor lighting design and city planning will be discussed. Given the amplified data variability, comparative visualization techniques are likely to gain in importance in the future. Research challenges, directions, and issues concerning this innovative area are sketched at the end of the talk. Department of Computer Graphics and Interaction has been awarded the status of NVIDIA GPU Research Center at the beginning of 2016. Status award will benefit us receiving pre-release access to hardware and software (e.g. Tesla K40) to be used for our reasearch in areas of rendering and advanced image manipulation. GPU Research Center status is shared with Faculty of Nuclear Sciences and Physical Engineering. 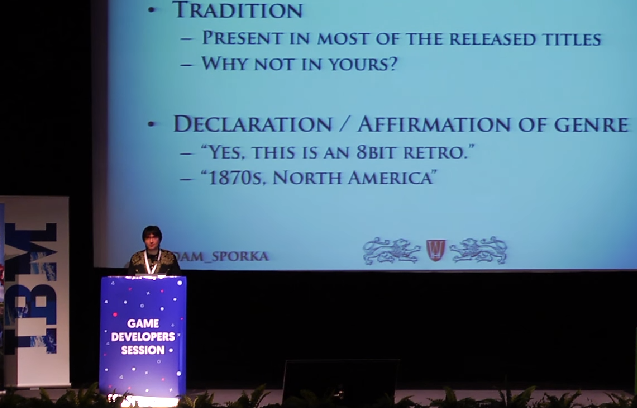 The music in our game responds to the actions of the player. It goes from peaceful to agitated when the player is attacked by enemy NPC, from neutral to dark when entering a cave, etc. The challenge is to respond swiftly, make the transitions between parts of the soundtrack as seamless as possible (maintain the correct voicing and harmonic progressions), and above all, have diverse yet consistent soundtrack. 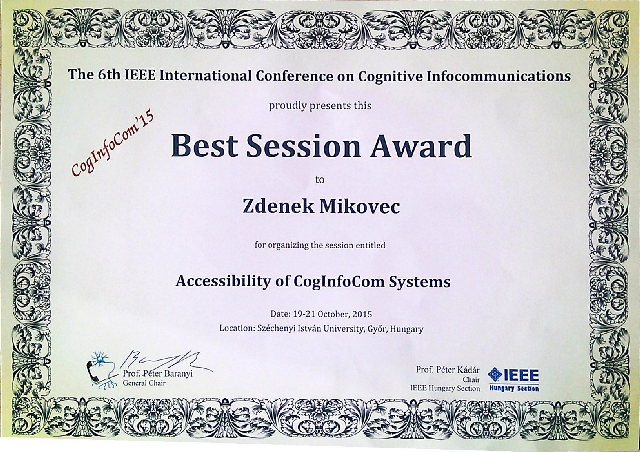 Our member Zdeněk Míkovec has been awarded by the The Best Session Award at the 6th IEEE International Conference on Cognitive Infocommunications 2015 for organizing the session entitled Accessibility of CogInfoCom Systems. 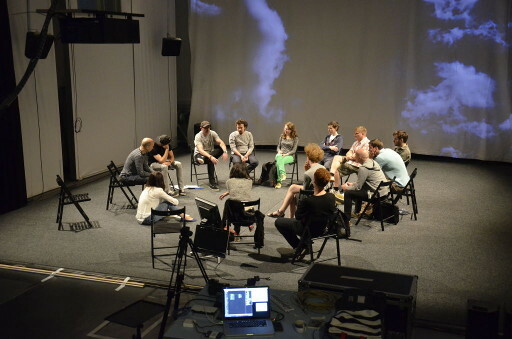 The summer school PULSEE started today in Institute of intermedia. It is led by Bozkurt Karasu (MIT, Cambridge, USA). The intensive workshop will be finished by public presentation of students' work on 19th June form 2pm in IIM. The presentations will continue on theatre board of brodthers Formans - “Tajemství” where also afterparty will be held. The students and professionals working in the area of intermedia will meet there. You all are invited! 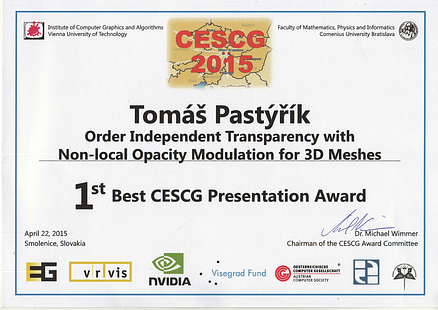 The awarded paper Order Independent Transparency with Non-local Opacity Modulation for 3D Meshes was a part of his diploma thesis supervised by our member Ladislav Čmolík. 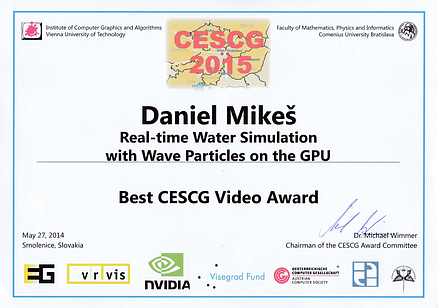 He presented a paper Real-time Water Simulation with Wave Particles on the GPU, which originate from his diploma thesis supervised by our member Jiří Bittner. EuroNews broadcasted a short documentary about successful cooperation of DCGI with movie industry. DCGI opened Triangle, a workroom and lounge for students working on bachelor and diploma theses supervised by DCGI's faculty members. It's a nice and comfortable environment for work on a project, consult the class material with colleagues, do little presentations, or just sit down and have a cuppa or coffee. We offer an open position for one undergraduate or graduate student in a research project dealing with fast construction of data structures for ray tracing on mobile phones. The work will be conducted in cooperation with our partner from abroad and it can also become a topic of a master thesis. Interested students should send their CV, list of subjects studied with grades, example of their own C++ source codes, possible copies of documents showing their strong abilities such as diplomas from contests, and a motivation letter to Jiri Bittner (see the contact below), who can also respond to any questions dealing with the position. The job interviews will be organized in November 2014. The deadline for sending the application is November 14th, 2014. Application should be submitted to Jiri Bittner, E-mail: bittner@fel.cvut.cz, http://dcgi.felk.cvut.cz/~bittner. In this talk I describe methods to capture the real world around us using cheap commodity 3D-cameras such as the Microsoft Kinect or any of its successors. These cameras deliver 30 depth images per second, but each at only low quality. Yet, with the fusion of such a depth image stream, 3D-scans of decent quality can be made. I will describe extensions that make it possible to scan large scenes and show results from scanning sessions in an excavation site in Turkey. Another extension handles the realtime capturing of deformable objects such as faces, hands, or bodies. Finally, I will show a very recent new realtime approach combining depth and RGB-data to increase the resolution of the captured geometry. This work addresses the problem of estimating and tracking the 6D Pose of specific objects from a single RGB-D image. We present a flexible approach that can deal with generic objects, both textured and texture-less. The key new concept is a learned, intermediate representation in form of a dense 3D object coordinate estimate paired with a dense object labelling. Random forests are exploited to predict 3D object coordinates and object probability from local image patches. We pair this discriminative estimate with a generative explanation of the RGB-D image in an energy functional that is robustly minimized with a RANSAC like approach. Tracking is based on the particle filter framework for which we designed efficient proposal distributions in order to efficiently sample the six dimensional parameter space of object poses. The proposed approach allows for real-time tracking and is very robust to changes in lighting and to occlusions. 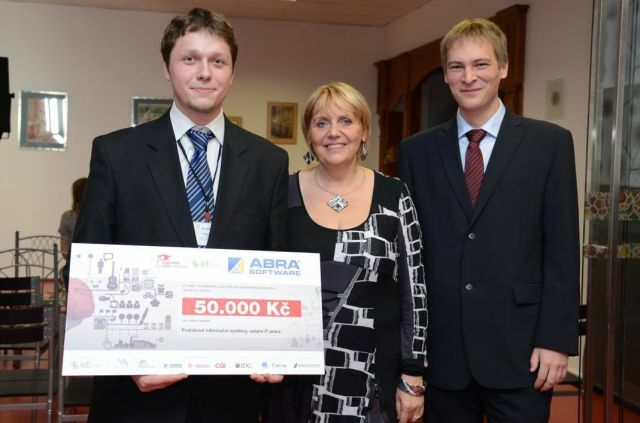 Our student Vojtěch Krs (on the left side of the photo) has been awarded by the 1st prize for the best master's thesis of the year 2014 in the category “Enterprise Information Systems, other IT works”. The awarded thesis Sculpting in Virtual Reality was supervised by our member, Ondřej Jamriška (on the right side of the photo). Paper Ink-and-Ray: Bas-Relief Meshes for Adding Global Illumination Effects to Hand-Drawn Characters will be presented at SIGGRAPH 2014! Paper Color Me Noisy: Example-based Rendering of Hand-colored Animations with Temporal Noise Control was accepted to EGSR 2014! Paper Massively Parallel Hierarchical Scene Processing with Applications in Rendering will be presented at EGSR 2014! 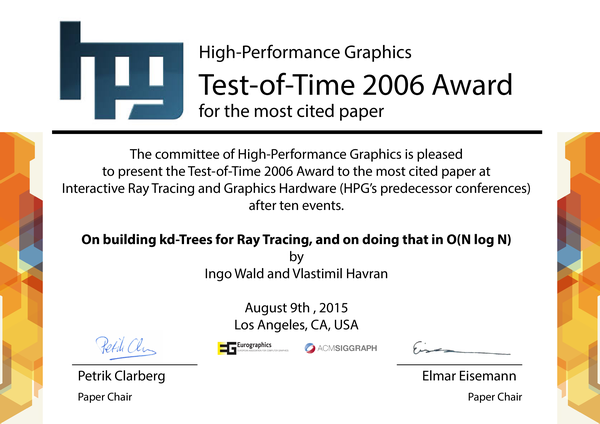 Paper Efficient Memory Allocator for GPUs was accepted to HPG 2014! Due to the immense parallel processing power of modern graphics hardware, ray tracing algorithms and applications on the GPU have emerged. Depsite several architectural challanges, real-time recursive ray tracing has become possible. More sophisticated global illumination algorithms however still pose major challanges for efficient implementations on the GPU. After a short introduction into the programming model and the processing flow of GPUs, recent advances in real-time ray tracing will be discussed. These include acceleration data structures as well as a study of memory access and latency during intersection testing. In this context, the general problem of divergence and approaches to improve thread utilization will also be presented. The talk closes with an overview of techniques to implement more sophisticated global illumination algorithms like path tracing, bi-directional path tracing and Metropolis light transport, while putting an emphasis on the open problems in this field. The application for job positions are in PDF document. The deadline for submitting the document is 18th April 2014. Procedural modeling has proven to be a powerful set of algorithms and techniques and it has been used for generation of a wide-variety of objects and effects. However, their definition is a tedious and non-intuitive task that is usually done either by experts, or by a trial and error approach. In this presentation, we will show some of our results in the field of inverse procedural modeling where we attempt to find a procedural representation of an existing object or a scene. Various examples of learning models from biology, urban models, and other procedural representations will be presented. Detailed information about invited speaker and his talk. Visual computing encompasses a multitude of subjects which have evolved around a common goal: creating and understanding worlds with pictures. Recently, appearance fabrication has emerged as an exciting topic in visual computing: it addresses how to employ rapid manufacturing techniques in order to build tangible artifacts which have a predefined appearance. In this talk, I will present my contributions to appearance manufacturing, discussing passive reflectance field displays and printed subsurface scattering. Further, I will show how the use of rapid manufacturing techniques for computational photography enables refocusing images after they were taken. Czech engineers have decided to join forces and create a navigation system for the blind that help them move around the city. The project includes the improvement of the mobile navigation, design of a special bracelet that improve the orientation in an unfamiliar environment and at last but not least, the creation of the game communicating with players using touch and heat. Paper Painting by Feature: Texture Boundaries for Example-based Image Creation was accepted to SIGGRAPH 2013! Paper Temporally Coherent Adaptive Sampling for Imperfect Shadow Maps was accepted to EGSR 2013! Paper BRDF Slices: Accurate Adaptive Anisotropic Appearance Acquisition was accepted to CVPR 2013! Short version of DCGI Annual Report 2012 has been published. It will become a part of the faculty annual report. 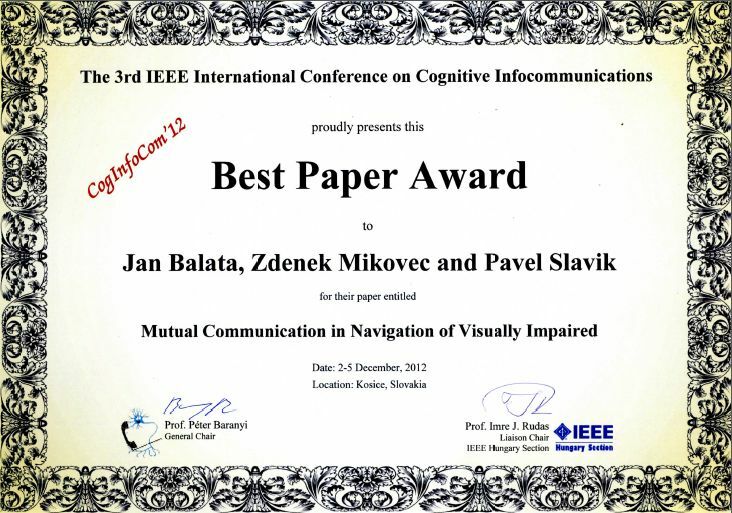 Jan Balata, Zdeněk Míkovec, and Pavel Slavík received Best Paper Award at the 3rd IEEE International Conference on Cognitive Infocommunications (held in Košice, Slovakia on 2-5 December 2012) for their paper entitled: Mutual Communication in Navigation of Visually Impaired. The Practical Course on Developing Electronic Music Tools and Light Controllers organized in Institute of intermedia. JOIN THE FANTASTIC ARDUINO TUNING MUSIC WORKSHOP IN SUMMER PRAGUE Under the supervision of the skilled professionals you will find out how to create a real electronic musical instrument using the Arduino prototyping platform. You will enjoy a lot of fun controlling your own synthesizer by MIDI and using it together with large programmable stage lights. 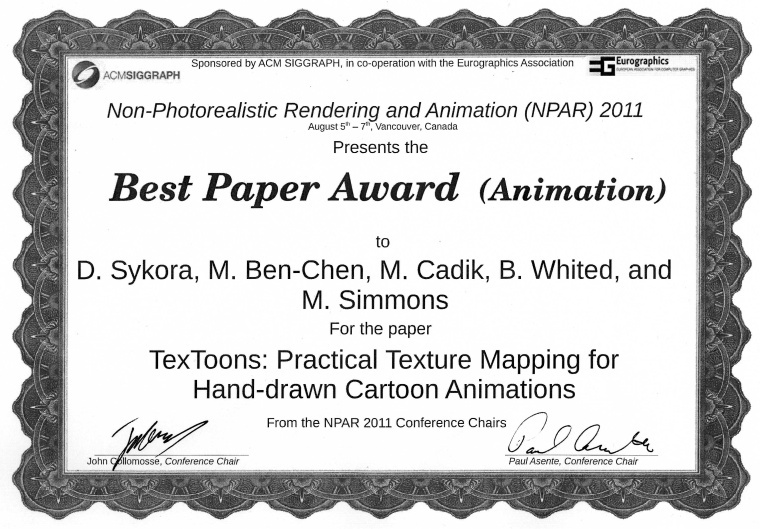 Daniel Sýkora, Mirela Ben-Chen, Martin Čadík, Brian Whited and Maryann Simmons received Best Paper Award (in Animation) at International Symposium on Non-Photorealistic Animation and Rendering in Vancouver, Canada on 5–7 August 2011, collocated with SIGGRAPH 2011 for their paper: TexToons: Practical Texture Mapping for Hand-drawn Cartoon Animations. 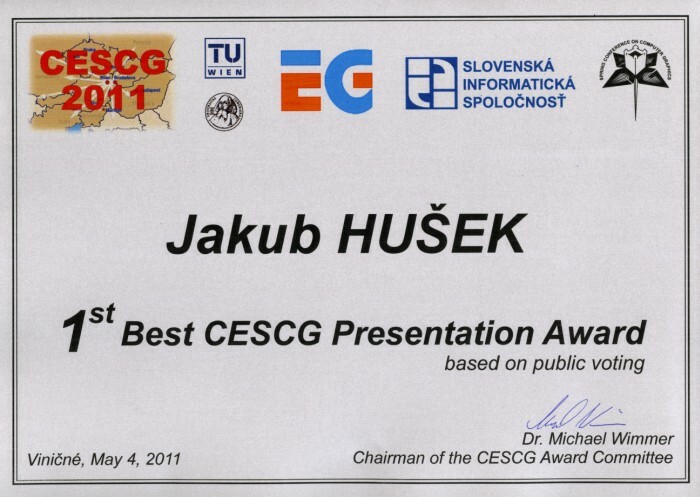 Our student Jakub Hušek has been awarded by the 1st prize for the Best Presentation of the student conference CESCG 2011. The awarded presentation Multi-touch Table with Image Capturing was part of his diploma work supervised by our member, Miroslav Macík. Czech Technical University and company HTC have opened the first mobile laboratory in the Czech Republic . Voxelization is a sampling process that transforms a continuously defined object into a discrete one represented as a voxel field. The voxel field can be used for rendering or other purposes which often involve a reconstruction of a continuous approximation of the original object. Objects to be voxelized need to fulfill certain representability conditions; otherwise, disturbing artifacts appear during reconstruction. We present a new method for voxelization of solid objects containing sharp details which extends the traditional distance-based voxelization by an a-priori detection of sharp object details and their subsequent modification in such a way that the resulting object to be voxelized fulfills the representability conditions. We exemplify the method by two classes of solid objects that normally contain such sharp details: implicit solids and solids resulting from CSG operations. In both cases, the sharp details are rounded to a specific curvature dictated by the sampling distance. 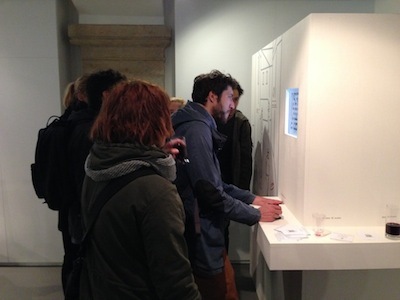 MUVIS is an extensible platform for online participatory urban planning. MUVIS (Multidimensional Urban Visions) offers for people, local authorities, and investors a dialogue of all participants and in a case study Virtual Petrzalka achieves creation, visualization, and discussing visions and plans. MUVIS offers a recent technology solution and improves current state and approach with explaining new methods to obtain - as optimal as possible - future of our cities. On the 14th of October 2010 at 5 p.m. the exhibition of student works will be opened. The exhibition will take place in the hallway at the 3rd floor, E building, Karlovo nam. 13. 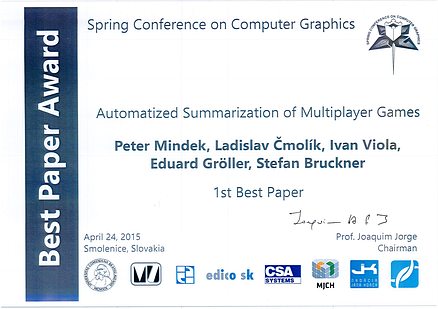 The paper by Jiří Danihelka, Roman Hák, Lukáš Kencl and Jiří Žára, titled “3D Talking-Head Interface to Voice-Interactive Services on Mobile Phones” receives BEST PAPER AWARD at the 5th Workshop on Speech in Mobile and Pervasive Environments SiMPE (in conjunction with the ACM MobileHCI 2010 conference) on September 7, 2010 in Lisbon, Portugal. Congratulations for a great success at a respected international workshop and a strong achievement for the 3D Mobile Internet team! Many thanks go to Vodafone Foundation Czech Republic for the continuous support of this project. 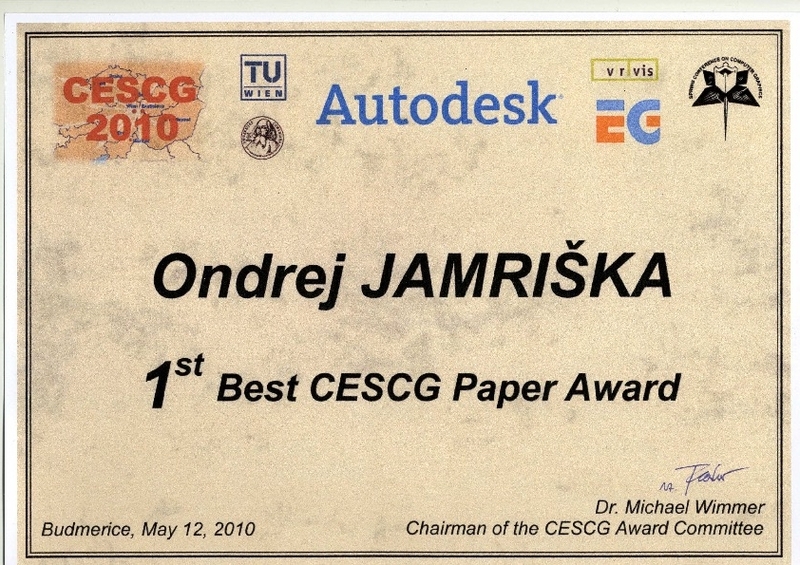 Our student Ondřej Jamriška has been awarded by the 1st prize for the Best Paper at the student conference CESCG 2010. The awarded paper Interactive Ray Tracing of Distance Fields was the subject of bachelor thesis supervised by our member, Vlastimil Havran. 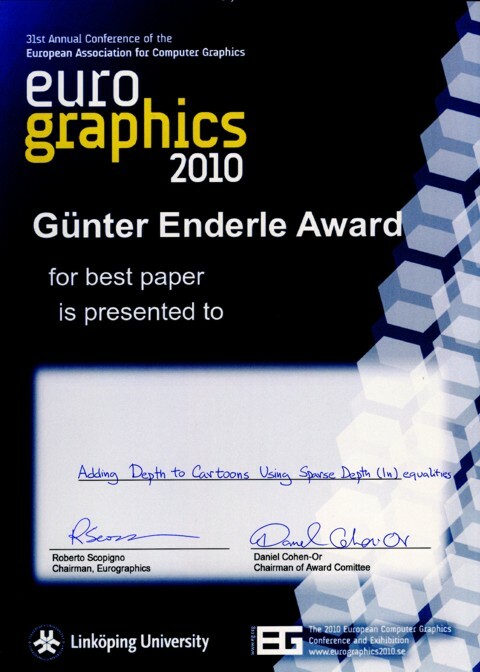 The authors team Daniel Sýkora, David Sedláček, Sun Jinchao, John Dingliana, and Steven Collins received Günter Enderle Award (Best Paper Award) at prestigious conference Eurographics 2010 for their contribution Adding Depth to Cartoons Using Sparse Depth (In)equalities. The main author, Daniel Sýkora, after receiving PhD degree (supervisor prof. Žára) moved to Trinity College Dublin where he works as research fellow, David Sedláček is PhD student at CTU in Prague (supervisor prof. Žára). CTU Team defended successfully i2home project. It was broadcasted by BBC. Links to these videos you can find here. CTU-Interoperability Lab (IOL) is the new joint project of CTU fakulty of Electrical Engineering and Microsoft coordinated by Technology Exploration Center(TEC). DCGI is one of the partners in a new VERITAS project granted in the scope of the 7th Framework programme of the EU. VERITAS aims to develop, validate and assess an open framework for built-in accessibility support at all stages of ICT and non-ICT product development, including specification, design, development and testing. The goal is to introduce simulation-based and VR testing at all stages of product design and development into the automotive, smart living spaces, workplace, infotainment and personal healthcare applications areas. This should ensure that future products and services are being systematically designed for all people including those with disabilities and functional limitations.